Commercial storage buildings depend on a number of specific requirements. 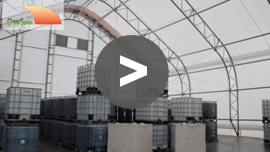 ClearSpan is an industry-leader in commercial storage, and no matter what you need storage space for, ClearSpan can create a building solution that provides the maximum storage space and is tailored to your exact storage needs. When you buy a commercial storage building from ClearSpan, you get a dependable structure that ensures your goods get the protection they need and workers have a safe working environment. ClearSpan structures are made from the highest-quality materials, and the one-stop shopping experience, which includes in-house design, manufacturing, financing, installation and more, ensures that you get exactly what you need. ClearSpan provides multiple designs, including fabric, metal and hybrid buildings, at a low cost per square foot, so there is a structure for any commercial storage application that can be tailored to even the most specific needs. ClearSpan provides economical foundation options – including pre-cast or poured concrete- quick construction timelines, as well as stock, turnkey and design-build solutions, creating budget-friendly structures in a fraction of the time it takes to build traditional wood or red iron buildings. Commercial storage structures are built with USA-made, triple-galvanized structural steel frames that are corrosion resistant and feature an industry leading 50 year warranty. Building solutions are available up to 300’ wide and at any length, ensuring that no matter the storage requirement, there is plenty of available space. ClearSpan buildings can be engineered to meet any municipal and regional building requirements, and these structures can withstand balanced and unbalanced snow loads, as well as a minimum of 90 mph winds. ClearSpan buildings can be temporary or permanent and provide an option that can be quickly and easily relocated or expanded upon. The versatile nature of these buildings makes them an ideal storage solution for any business. ClearSpan also offers a number of foundation options, including the a Helical Anchoring System that allows users to easily relocate the structure as needed. While it can be easily transported, Helical Anchors can remain in the ground and create a secure and permanent foundation. Due to their temporary nature, storage buildings generally require little to no property taxes, and this, combined with the minimal required maintenance and the lack of space for rodents and other pests to occupy, creates a solution that is easy and low in cost to maintain.